Lenhardt Engineering is providing CPM support to Caltrans for a $37 million project to alleviate the bottleneck that forms at the 101/23 interchange. 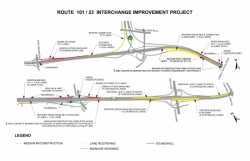 The project will add a lane to the 101/23 connector ramps and the 101 freeway. Bridges at Hampshire, Conejo School and Moorpark roads will be widened on the northbound side. At the same time, Moorpark Road’s northbound on-ramp will be realigned and a lane added. Hampshire’s northbound on- and off-ramps will also be realigned and ound walls will be installed.